If you are searching for a security camera, there are different brands that you can take for consideration. However, you have to remember that not all brands are the same and some don’t work as they promise. Today, one of the known brands that offer cost-effective security systems is GW Security Inc 16 Security Camera System. 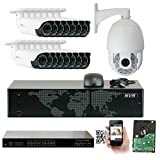 The main reason why GW Security Inc 16 Security Camera System is very popular is because this is best out there and works effectively. It is easy to setup and can be used without any hassles once installed properly. 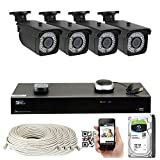 With GW Security Inc 16 Security Camera System, it is easier for you to get a close up of trespassers and show this to the police to help with tracking in case they stole one of your precious belongings. You can also trace the number of people who entered your property without the need to guess. 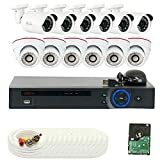 Who is the GW Security Inc 16 Security Camera System Designed for? Busy people – the GW security cameras allow you to monitor your cameras on the go. The GW Security apps are available on both Android and iOS devices. 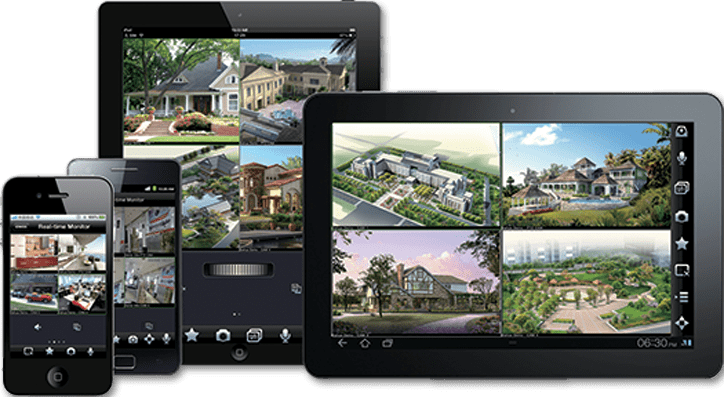 Business owners and homeowners with large properties – with 16 cameras, it’s easy to get total coverage of your property. This is particularly important for sensitive areas, like the front door of a home, or the cash registers at a business. Anyone who wants to protect their property – We like to hope for the best but prepare for the worst. 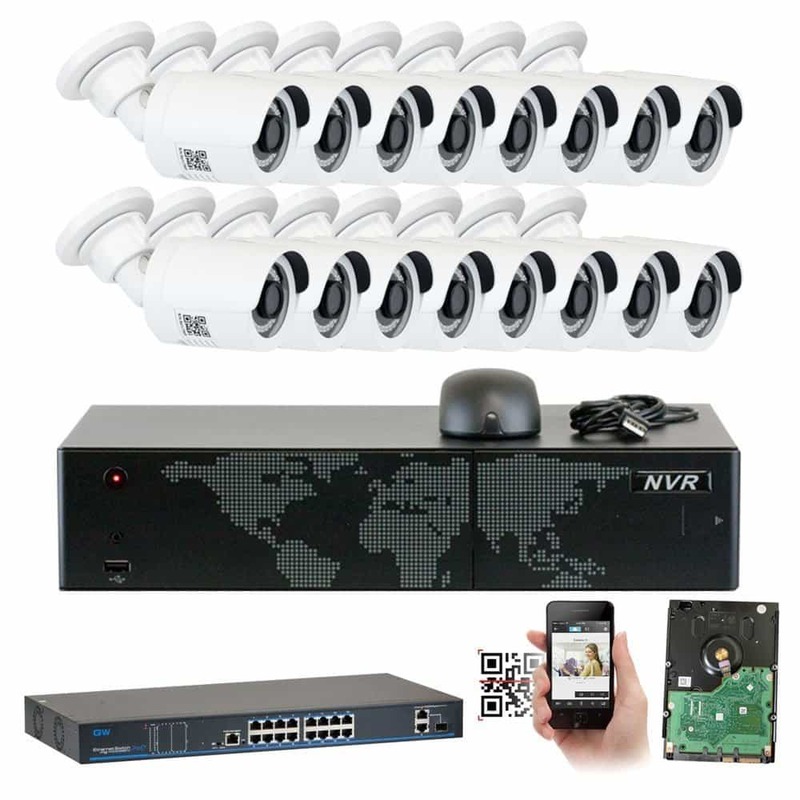 With a robust surveillance system like this, you’ll be prepared in case of theft, accident, or any other misfortune. 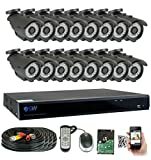 GW Security Inc 16 Security Camera System comes with various features that will level up your security and safety. One of its features is a 5MP super 1920p HD that captures crisp topnotch quality HD video. It also provides you higher resolution compared to a standard HD camera. Other features it includes a 16 channel full HD 5MP NVR and bullet cameras that allow daytime and night time monitoring. Every dome or bullet camera houses premium IR LED inside of it and this is capable of recording up to 196 feet. Its built-in manual zoom HD lens enables you to adjust the angle of a view. 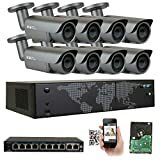 A network cable directly connects every IP camera to NVR supplying both a video and power signal. With this, you don’t need extra power cable. Just plug 1 cable for 1 camera and it’s ready to go. 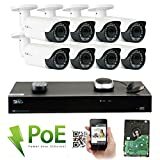 This security system includes a 16 Ports PoE Switch that offers power and data with the use of single Ethernet cable. 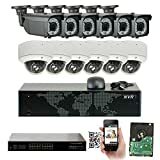 GW Security Inc 16 Security Camera System allows you to capture HD videos 3 times higher than the cameras with 1080p with its 1920p resolution. With this feature, expect to get clearer videos compared to some security systems available in the market. Clear videos can also help you determine everything in the video without the need for you to install a more expensive security system. Every IP camera delivers 5MP at 2592×1920 resolution with bigger and sharper video and image than 1080 pixel security cameras. One main concern of many security system users is blurred images. With GW Security Inc 16 Security Camera System, it will never be your issue. It supports remote view through the use of 3G mobile and smartphone with systems including Windows XP, 7, 8, 10, Vista, iPhone, iPad, Mac, and Android. Network remote access will give you ease when monitoring videos at home or anywhere you are. Just make sure to install the right and working app as this will let you access videos remotely without experiencing any issues. The manual zoom Varifocal lens of GW Security Inc 16 Security Camera System provides more range compared to the cameras with fixed lens and enable you to adjust the view’s angle from 98 degrees-22 degrees, a smaller lens value that will show shorter viewing distance as well as view’s wide angle field. The bigger lens value will allow longer viewing distance, yet view’s narrower field. One of our favorite ways to judge a security camera (maybe one of the only ways!) is to see it in use. We find it helps to see some test footage across different situations – day and night, indoor and outdoor, etc. We also love seeing the software used to manage a system before we make a purchase. We’ve included a video below that can show you the GW Security 16 Security Camera system in action. Pre-installed 2TB Hard Drive. 1 Year Warranty and Free Tech Support within U.S. 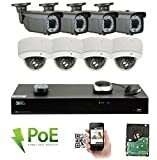 Built in 2.8~12mm Manual Zoom Varifocal Lens which allow you to adjust the angle of View, (Bullet camera) 64Pcs / (Dome camera) 30Pcs Infrared LED, View up to 180ft / 80ft IR Distance for night vision. Plug-and-Play. Easy to configure, access and control. Scan QR Code on DVR to instantly access live viewing and playback. Pre-installed 4TB Hard Drive and (16) Pre-made BNC cables. 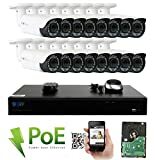 1 Year Warranty and Free Life Time Tech Support From U.S.A.
(16) 5MP 1920P 2.8~12mm Varifocal Manual Zoom PoE IP Cameras --Super Clear Image Quality--Day and night full day monitoring - Each IP camera houses 72 premium IR LEDs inside of it and is capable of recording up to 196ft super long Night Vision IR distance with Auto IR-Cut Switch, WDR and 3D-DNR. Pre-installed 4TB Hard Drive with 1 Year Warranty and Free Life Time Tech Support From U.S.A.
Includes Motion Detection & Snapshot & Email Alerts & USB backup feature for peace of mind. Pre-installed 4TB Hard Drive with 1 Year Warranty and Free Life Time Tech Support From U.S.A. The setup is very intuitive. Its QR code to setup the app is very fast. You won’t have a hard time setting up the router and DDNS was nice. It captures clear and high quality HD resolution video. Its high resolution camera works effectively. Powered through an Ethernet setup, it’s simple and clean with only a network cable. It includes six domes and fourteen bullets with 5M manual varifocal manual zoom. It has long night vision IR distance. There’s a pre-installed eight terabyte hard drive with 1 year warranty as well as free of charge lifetime tech support from America. Pixelation will never be an issue. It works on your WiFi easily without the need to deal with complicated information. The only concern with this security system is the video quality. You will need more time to figure out the system. 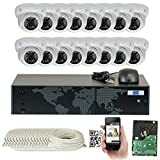 Question: Is there an app for GW Security Inc 16 Security Camera System? Answer: Yes, there is. You can use TMEYE PRO, which is a free Android app. 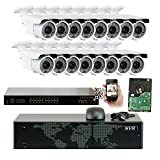 Question: Is it a good system that provides HD video and motion detection recording? Answer: This security system provides very clear videos. Unfortunately, it might not work properly when it comes to motion recording. Question: Is there an iPhone app for this? Answer: Does it come with a night vision capability feature? Answer: Its DVR Night Vision isn’t responsible to generate night vision, yet it’s compatible with the night vision cameras. Many buyers like how GW Security Inc 16 Security Camera System works. But, they often forget that it isn’t weatherproof. So, make sure to install this in a place where it is safe from any weather disturbance to ensure that it will work for many years to come. 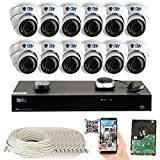 With the HD Lens of GW Security Inc 16 Security Camera System and other features it offers, you can guarantee that this security system will work flawlessly. Another good thing about its manufacturer is that this is just a phone call away that will help you with any concern you have. So, if you want to make sure that your property is safe and secure, this is one of the best security systems.